Whether you are looking for a woodland stroll, a rocky scramble, or a river float, the Yakutat area boasts a healthy network of trails. Listed below are six trails that should offer prime wildlife viewing opportunities. You will find specific information about these and other area trails, such as directions to the trailheads, trail distance, and elevation gain, at the Southeast Alaska Trail System. On the .4 mile gravel road leading to the trail, look for birds in flight in the open areas, like alder flycatcher and common Yakutat warblers, especially yellow-rumped and orange-crowned. In addition, look carefully for conifer loving species such as white-wing crossbill and pine grosbeak. For more information, visit Seatrails — Fish Train Trail. Massive icebergs, calved from Yakutat Glacier can be seen floating from shore. Mew gulls sometimes make their nests on the ice. Look for cliff swallows nesting under the bridge, Arctic terns diving for fish, molting Canada geese and red-necked phalaropes. 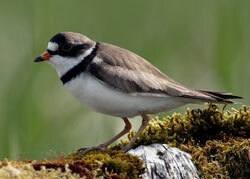 Watch for gulls along the shore and passerine species like varied thrush and ruby-crowned kinglet. 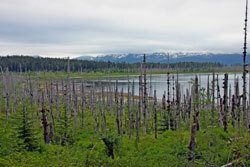 For more information, visit Seatrails — Harlequin Lake trail. In a short distance, this forested trail leads hikers to open waters of Russell Fjord. Walk the beaches – paying attention to the tides – and look for murrelets, loons, white-winged scoters, pigeon guillemots, Aleutian and Arctic terns, gulls, phalaropes, jaegers. On the shore be alert for black oystercatchers. This trail is in prime moose and bear habitat. For more information, visit Seatrails — Russell Fjord Trail. Situk Lake is the headwaters of the Situk River. On the trail, expect passerine species like winter wren, Wilson’s warbler, hermit and rarely gray-cheeked thrush. On the lake expect nesting trumpeter swans, various species of waterfowl, goldeneye, mergansers, and gulls. Shorebirds, like yellowlegs, spotted and least sandpipers are possible. This trail is in prime moose and bear habitat. For more information, visit Seatrails — Situk Lake Trail. This trail follows the Situk River, beginning at the Nine-Mile Bridge and ending at a beautiful USFS cabin on the river. Five species of Pacific salmon, Dolly Varden trout, and the state’s largest documented run of steelhead are found along the river’s 20-mile length. The annual return of anadromous fish to the Situk is about 450,000 fish, that’s over 22,000 fish per river mile. For more information, visit Seatrails — Situk River Trail. The trail crosses fairly mature forest. Expect to encounter thrushes, kinglets and even creepers. The lagoon may have waterfowl and at its edges shorebirds in spring and fall. A side trip to the harbor may yield murrelets, sea ducks, cormorants, gulls, and eagles. This trail is in bear habitat. For more information, visit Seatrails — Totem Trail/Boat harbor.